Developing accurate marketing plans and strategies for your business is the most challenging thing today. Unlike the 60s, competition is everywhere and clients & customer can find countless options with one quick click. You have got a fraction of a second to engage and connect with consumers or they are out back to their search, back to an old standby site, back to their second option. Customers wish to acquire what they want, right now, and if you don’t deliver at the same time, they’ll find someone else who can deliver them the same thing and those are your said competitors. An effective modern marketing strategy will help you take the right decision to make a brand successful. We at CDN Software Solutions have a small answer for your question and i. e Digital Marketing. The second name or synonym of modern marketing these days is Digital Marketing. Digital Marketing techniques has steadily been transforming the marketing profession, adding new techniques, tools, and strategies. Modern Marketing have 2 sides: An Artist or Scientist. Here we are showing the role of both Artist and Scientist. By working on both an artist side and a scientist side, you are capable of quickly adapting and thriving in the rapidly changing marketing industry. As a business with an online and offline presence, you need to focus on integrated marketing efforts that allow you to bridge the gap between brick and mortar. So follow these techniques to boost-up your business. Speaking engagements have always been an important part of the business world, they are now being leveraged as marketing opportunities. This technique works in both cases either it’s offline or online. Talking about offline side, speaking engagements allow organizations & brands to engage with clients & customers in a very personal way. This face-to-face communication is priceless and quickly establishes trust that would otherwise take weeks, months, or even years to build online. Talking about online side, you can create actual speaking engagement material like videos, PPTs, two way communicative blogs, Asking questions to your audience, use social media platform to share your thoughts, services, products and other things. Print your discount or offer coupons or talk about your services and products digitally or sending it to your target audience in the form of message. The benefit of mobile check-in is that you are able to engage customers who are in your store in real time while also broadcasting their physical interactions to their online networks. So these are some latest modern marketing techniques that will definitely speed-up your business sales and help you in building reputation of your brand or organization. 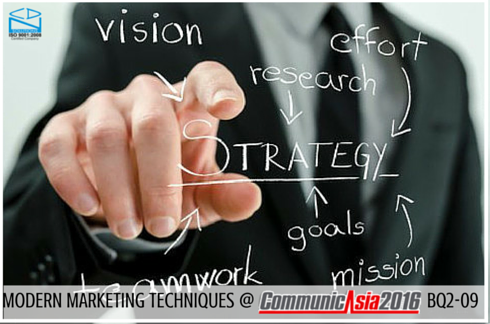 If you also wish to implement trending marketing tactics to your business then do meet us in CommunicAsia 2016 at stand BQ2-09.We will give you some more mind-blowing ideas. We are also providing free passes for this event, so you can avail the same as well here.